After a week in the big city with its bright lights, buzzing crowds, churning traffic, tall buildings and the exciting but exhausting feelings of speed and pressure it was a relief to be back in the Cairngorms and to spend a few hours in the hills. In a gap between early and late appointments I wandered up the long northern ridge of Cairn Gorm, a quiet, little-frequented place despite its proximity to Glen More and the Cairngorm Mountain resort. I passed a group huddled round a map – students from Glenmore Lodge practising navigation techniques I assumed (one of the few vehicles in the Coire na Ciste car park was a Lodge van) – and a lone walker heading for Cnap Coire na Spreidhe.and then no-one until the summit of Cairn Gorm. Just mountain hares and ptarmigan and a flock of snow buntings. Everywhere there was soil the ground was sodden from the heavy rains of previous weeks. The burns roared and seethed with white water. Yellow-green moss was spreading over the heather in many places, looking as though it was crawling over the ground. 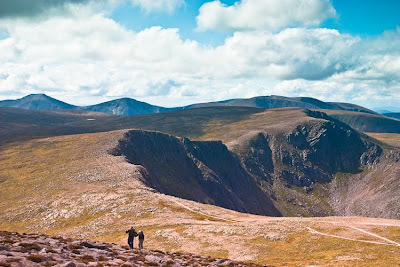 Along the eastern edge of the ridge there is a ragged scattering of rough granite tors, looming above steep, broken scree and boulder slopes falling into the deep, narrow trench of Strath Nethy across which rises the curving profile of Bynack More. Further south the scattering of tors on Beinn Mheadhoin can be seen, the slopes curving down to shining Loch Etchachan, cupped in its bowl in the hills. Above the loch the rough hillside climbs again to the rounded summit of Ben Macdui. Wonderful wild country, all wonderful wild country. On the summit of Cairn Gorm I joined a dozen other walkers. A cold south-west wind swept across the top and I needed to don a warm jacket. Others were wearing hats and gloves. According to the automatic weather station data the temperature was 8ºC and the wind was gusting to 35mph. The air was sharp and clear though and the views distinct and extensive. To the west I looked across Coire an t-Sneachda and Cairn Lochan to Braeriach, Sgor an Lochan Uaine and Cairn Toul, rippling brown curves of mountain rising and falling in the sunshine, wild and magnificent. 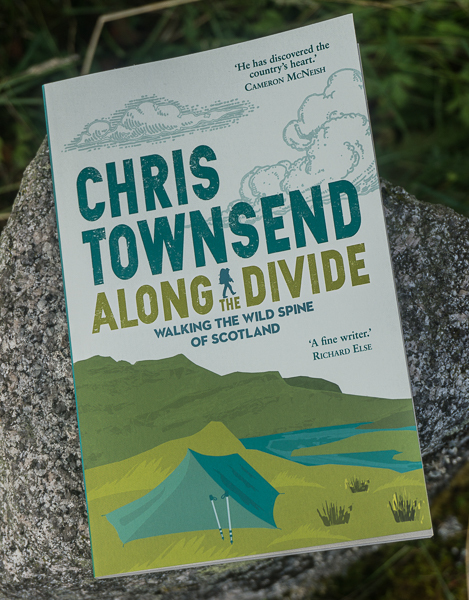 Turning away I headed down towards the bright blue eye of Loch Morlich and the dark green of the pine forest, the savage confusion of the city blown away in the wind and the space and the freedom of the sky and the mountains. "...the savage confusion of the city blown away in the wind and the space and the freedom of the sky and the mountains." I hear that. You do have a way with words! I can think of no better way to relax and unwind from a busy time. 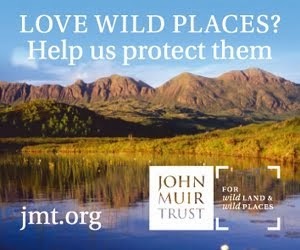 It is a special place to visit let alone have on your doorstep. Your oratory is very good and tells a contrasting story of the wild places and the busy city. 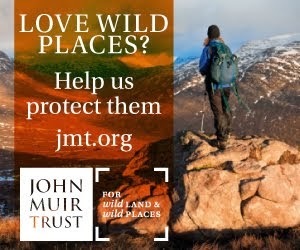 How we need to have wild places to retreat into. Its always the contrast that does it for me. When I was working and living in London it was a palpable relief to go back to the mountains of South Wales for a dose of sanity and soul's ease.